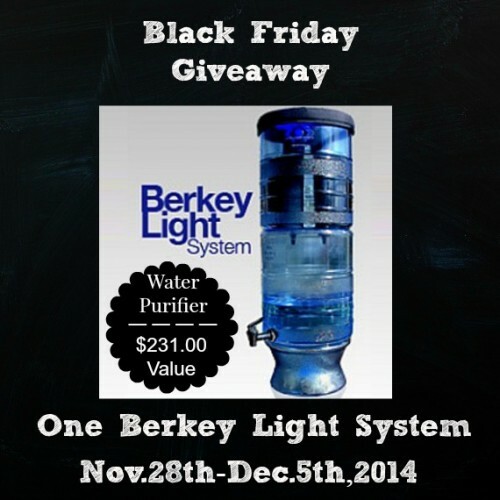 Black Friday Berkey Light Water Purifer Giveaway! We are excited to share this Berkey Light Water Purifier Giveaway that is sponsored by our friends at LPC Survival. The Berkey Light Water Purifier is an ideal water filtration system for everyday use at home, travel, outdoors, or during emergencies. Includes one set of (2) Black Berkey Elements. The Berkey Light is easy to set up and install. Containers made of shatter-resistant, non BPA, copolyester material. If you have always wanted to own one, now’s your chance! Submit your entries below. This Berkey Light System is a sponsored giveaway and open to any resident who is 18 years of age or older who lives in one of the 48 US Contiguous States. This giveaway starts on Friday, Nov. 28th at 5:00 am (MST) and ends on Friday, Dec.5th, 2014 at 5:00 pm (MST). The winner will be notified by email and will have 24 hours to respond. If we do not hear back from said winner in the designated time period of 24 hours we will choose another winner and they will have 24 hours to respond from the time the notification email is sent. Please check your SPAM email folders. Good luck to everyone! Thank you for the opportunity! Living in a hurricane zone, I could sure use this!